I wish I knew it before, when I just started my career as a customer service representative. It would save me many restless moments and probably let enjoy my job more at some points of my life. But I also believe that any knowledge comes exactly when you really need it. And now when I am conscious of the burnout challenge and have some experience under my belt, I am happy to share my tips on how to prevent or avoid occupational burnout in customer service. Hope this article will give you some helpful advice and actionable tips you can use. 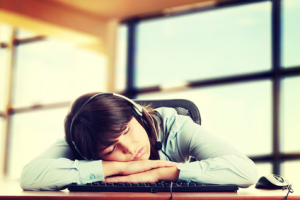 Burnout is a widespread issue in customer service today. It was first identified in the 1970s as a career crisis hitting professionals who deal with people as a part of their job. The phenomenon was characterized by changes in employees’ attitude to work, resulting in exhaustion, lack of enthusiasm and motivation, as well as feelings of ineffectiveness or even frustration and cynicism in relation to their job. Since then psychologists have carried out substantial research into job burnout and its many negative effects on employees’ health and relationships, both personal and professional. Despite all the knowledge we have about the nature of the phenomenon, its causes and consequences, it still persists and remains a major career challenge nowadays. It rather brews for a long time below the surface and comes out in manifold stages and various shades, forms and sizes. Producing feelings of hopelessness, stagnation, resentment, fatigue, among many others, burnout is one of the most common reasons why service-industry employees quit their jobs in the twenty-first century. Customer service professionals are more prone to burnout due to the high stress work environment and emotional aspects of the job. The more you enjoy your work and the more seriously you take the task of serving customers well, the more vulnerable you may be to the effects of burnout, states Pattie Gibson in “The World of Customer Service“. What Can You Do To Guard Against Burnout? Customer service people need care, too. To prevent or avoid negative causes of job burnout, we need to keep focused on what we feel and how we perceive our job. If you start noticing early signs of burnout, you can keep from getting worse if you immediately start caring of yourself. The more you try to repress the troubling emotions, the greater the chances are that pressure and tensions are mounting. Don’t put it off till tomorrow, face it today. Obvious though it might sound, to be away from stress it is essential to get enough sleep, eat healthy food and drink plenty of water. These are the three major elements that you need to take into account to minimize causes of job-related stress and make sure you are strong enough to get over it. If you have not yet been taking these habits seriously, I can tell you that it’s much easier said than done. But it’s worth the efforts. According to multiple sources good habits take from 20 to 70 days to stick. Why not try and find out how much it will take for you? Regular physical activity has amazing benefits. It helps relieve tension, anxiety, depression and anger, and also creates the overall feel-good sensation that you really need to re-balance. You can choose an enjoyable activity and start anytime, probably even without spending money or leaving your house. Just do it! You can go far if you think positively. If you believe that you can cope with the challenges that face you, you’re half the way done. Think of what you can learn in confronting the job challenges. There is always a way to notice a silver lightning and start flying higher, no matter how dark the clouds are or how low you have fallen. It might be tough at first, but it really works. We all need someone to tell us that it’s not too bad. So be the one for yourself. Positive thinking can be developed into a habit when practiced often enough, so over time you’ll be able to easily come up with finding something positive in any challenging situation. Hobbies can provide enjoyment and tremendous stress relief. There are a wealth of examples in books and movies to find inspiration and discover your true life passion. I really admire a story of Julia Powell, a frustrated secretary of a government agency, who started a cooking blog project to make her everyday life a little brighter. Though maybe not all pastimes involve such a huge success, if you spend at least an hour a day doing what you enjoy the most, it can make a great difference in improving your life quality. The old saying that laughter is the best medicine definitely holds true for those at the brink of burnout. Even a simple smile will do. A good sense of humor can help you respond positively to difficult situations and not take them too personally. Laura Stack in her book “Get Rid of Stress and Burnout: Boost Productivity with Emotional Control” suggests a good many of humor strategies for customer service reps. My favorite takeaway from the book is to approach difficult situations with funny language of symbols and signs that are just between you and your coworkers (Laura Stack’s humor strategies include Positive fish bowl pot, funny crab hats, secret code for swear words and even a fork in an eye). In difficult situations, these symbols are meant to remind you that you are not alone and make you smile. You are not alone. Most of your colleagues experience similar difficulties, or have faced them at some point in their careers. If you take the courage to share your concerns with them, you’ll get a better understanding of what is going on and how you can overcome the burnout issue. Of course, I don’t mean that you go and whine and complain, but you can get some helpful insight of how they perceive their job and what you can learn from their experience. Feeling of being overwhelmed with your job duties is a common sign of burnout. It looks that you have so many to-do items stacked in your head that there’s no end to it and you’ll never complete them all. Way off the mark! Take a moment to eliminate chaos and jot everything down. You’ll be surprised but it will be some 10 to 15 tasks in your list. The matter is that trying to joggle these tasks in your head is quite exhausting. When you put it down in writing, it looks far less daunting. Now put numbers to assign priority order and expand each item with 2-3 ideas how you can accomplish it efficiently. I’ll bet now you feel better about it. Trying to manage multiple tasks at the same time hurts. In fact, it is one of the most stressful factors of customer service job. Especially when you feel you’ve reached the point of burnout. Be aware of the negative consequences multitasking has on your working habits, job performance and personal health. If you would like to find out some great tips on how to deal with the multitasking challenge in customer service, check out this infographic. Ironically, we tend to keep focused on what has gone wrong or what we did not manage to accomplish properly. While there are many tasks that have been performed well or even perfectly, we don’t bother to pay much attention to them because we are too concerned about mistakes, flops or errors. Belay that. Even a bad day can have some good in it. Take a moment at the end of your working day to put down in writing 3 to 5 tasks or skills that are worth praising. You deserve to give yourself a big hand. As an old adage goes, the things you take for granted, someone else is praying for. You are healthy, fit and can perform your job. You are lucky to work in a warm and friendly office. Or probably you are blessed to have flexible working hours. Or you have the luxury of being able to work at home. Your job is enjoyable, you help people and make their lives easier. Take a look at your day-to-day world from a point of gratitude and you will be amazed at all the goodness you take for granted. Did you ever feel you reached the point of burnout at your work? What are your ways to overcome stress and prevent burnout? Will any of the mentioned above ideas work for you too? We would love to learn about your experience, so please leave a comment if you have something to share. And as always, thank you for reading our blog! This entry was posted in Articles and tagged burnout in customer service, job burnout. Bookmark the permalink. When I worked in the call center you had to multitask to do the job. If you couldn’t type, talk to the caller, and look up things at the same time you couldn’t do the job. This is not to mention the pace you had to keep. You had to adhere to a strict call handling time. In fact every job requires multitasking. It’s always one of the major requirements. People who can’t multitask are unemployable these days. Thank you for the comment, Deb. Right you are, ability to multitask is highly required in the customer service field. On the other hand, it’s also a major job stress factor that eventually can trigger professional burnout in customer service agents. That’s why every service-industry employee needs to be aware of the professional challenges related to multitasking and learn how to multitask correctly. Hello Sue. Thank you for your feedback. I agree with your point, people whose job is to take care of others often get aware of the burnout phenomenon only when they are eventually suffering it and get to the point where they cannot perform effectively. That’s why it’s important to know what burnout symptoms are and take the matter seriously. For me, a lot of the reason I end up burned out from a service job is related to the nature of the job and how it inhibits my ability to self-care. Irregular hours, varying schedule, low pay for high stress and high output, and lack of benefits all make it difficult to take a sick day or heaven forbid a vacation. It also makes having any kind of routine feel impossible. Trying to find time consistently to work out, grocery shop, and meal prep — especially when you never know what your paycheck is going to be — can be an exhausting endeavor in and of itself. Not having the time/ability to take regular breaks to eat or just step back and take 5 is also something that rapidly increases my reaching burnout-level meltdowns. Very tough job of call centre. you have to work in day or night shift to survive. But you have done a very good job by sharing this post. Good stuff regarding call centers industry is whatever job pressure is always on first step. My sister noticed that some of her employees are more stressed than usual. It was suggested here that positive thinking should be applied and nail stress with humor. Furthermore, it’s recommended to go to trusted professionals when considering work stress therapy.